Drawez! iSketch Pad can help you to record, replay, save and share your drawing process. Drawez! iSketch Pad helps you enjoy not only the result but also the process of drawing. Drawez! iSketch Pad key features: sketch with your mouse or drawing tablet; record and replay your sketching process; save the sketching process to a Flash animation (small file size) or a video file (.avi format); upload and share the sketching process. ...... Rapidshare, HellShare, HotFile, FileServe, MegaUpload, YouSendIt, SendSpace, DepositFiles, Letitbit, MailBigFile, DropSend, MediaMax, LeapFile, zUpload, MyOtherDrive, DivShare or MediaFire, are not allowed! Drawez! Sketch Pad is an easy-to-use drawing software. Drawez! Sketch Pad can help you to record, replay, save and share your drawing process. Drawez! Sketch Pad helps you enjoy not only the result but also the process of drawing. Drawez! 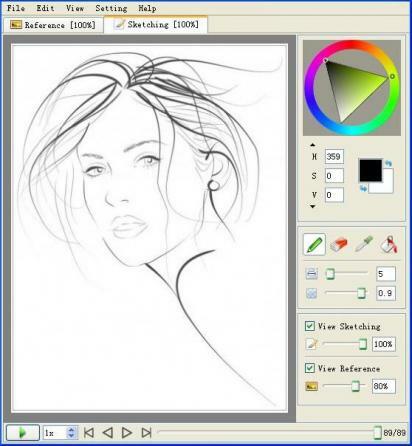 Sketch Pad main features: sketch with your mouse or drawing tablet; record and replay your sketching process; save the sketching process to a Flash animation (small file size) or a video file (.avi format); upload and share the sketching process; save the sketching to most popular graphics formats; support tracing and reference images. Qweas is providing links to Drawez! iSketch Pad 1.2 as a courtesy, and makes no representations regarding Drawez! iSketch Pad or any other applications or any information related thereto. Any questions, complaints or claims regarding this application Drawez! iSketch Pad 1.2 must be directed to the appropriate software vendor. You may click the publisher link of Drawez! iSketch Pad on the top of this page to get more details about the vendor.